At the heart of Wake Up To Organic is a delicious organic breakfast, as indie retailers across the country give away free mini-breakfast tasters to their customers. To encourage people to “wake up” to a simple, delicious organic treat, we supply participating stores with an ‘Event in a Box’, full of marketing materials, cups, pots, spoons, and a selection of sample products from leading organic brands. 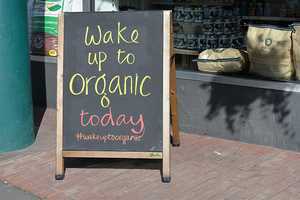 If you are creating a special Wake Up To Organic breakfast recipe, consider making it up into a store-branded recipe card to give away to your customers, or write it up on a chalk board which can be photographed. Have you thought about creating a discount voucher to give away on Wake Up day, such as 10% off any purchase until the end of June? It’s a great way to encourage repeat custom. You could highlight other organic product lines you have in-store too. These are just a few ideas. We’ll be sending out a Toolkit in the event boxes (and via email too) to make sure participants have plenty of ideas for how to run a great event.